Q: And why Mike Brown? Because it's a LeBron-friendly hire? A; Nah, the summer of 2010 proved that LeBron didn't weigh coaches in his Decision. Besides, 'Bron could name his HC wherever he goes, but front office ultimatums aren't his style. LeBron likes to be liked too much. Q: Because the organization is comfortable with Mike? A: No, familiarity often breeds contempt. Q: Because only four current NBA coaches have won a title and Mike Brown had the fattest resume? A: Not really; if past success was truly Dan Gilbert's hot button then Flip Saunders would've been his choice over Brown eight years ago. Q: So tell us, Vox, WHY was Mike Brown rehired? Q: Would like to expand on that? A: Byron drove Gilbert and Chris Grant to make this decision after three years of experiencing the Scott-skill-set. The Cavs spelled it out for us- they desired a workaholic majoring in defense. It's just a coincidence that Mike Brown matched the criteria. He's the polar opposite of Byron-- who did nothing here to dispel his rep for looking towards tee-times. And, even on critical possessions, the Cavs would part like the Red Sea on defense. If Scott had been even semi-competent, his replacement might've been an up-n-coming assistant. The Cavs are probably over-compensating for Byron's flaws with this hire. Q: Ah, Mike Brown is the anti-Byron Scott? A: You got it. Brown is the most egoless coach in pro sports. Byron, in full contrast, seemingly oozes arrogance . Drive-by fans see the record, give Byron a pass and chalk it up to our crappy roster. But unless you paid close attention to every game, you don't realize how much of a hand Scott had in our Stepien-culture. Perhaps you missed him laughing through pressers, smiling emphatically with beat reporters questioning his team's ineptitude. I know, right? It couldn't be me. I mean, look here, I'm Byron hardass Scott. Silly kids aren't getting the message, Mary. Q: Did you see Gilbert's tweets defending Brown? A: Cute stats, but here's what I'd have tweeted: The Cavs were a lottery team when Brown arrived in 2005. They won 50 games and nearly reached the conference finals in Brown's first season. You might argue it was those "impactful" signings of Donyell Marshall, Damon Jones and Larry Hughes, but I'll credit Coach. And, last season, Brown won one more playoff game with the exact same Lakers' roster that Phil Jackson had a year earlier. Q: Yeah, but remember how Stan Van Gundy went coaching-clinic on Mike Brown in 2009? A: (Nods) Bro, I still haven't recovered from that series. Q: So how will Brown ever win a championship now if he failed then? A: Championship? Why are we even taking about a championship? We haven't even sniffed the playoffs since LeBron left. You're like a dude who hasn't been laid in three years trying to bang Kate Upton. Slow down. Coach will help us do some regular season slump-busting. Maybe he'll even convince Kyrie it's OK to play hard against the bad teams with no television audience. Kid picks his spots more than a stain remover. Q: What else can Brown do for us? A: I'm hoping he can raise our club's collective IQ, hold twenty point leads, and use a timeout effectively. That should upgrade the win total by at least seven or eight. Q: How many games will we win next year? A: 44, earning Mike Brown Coach of the Year Honors for a second time. Q: That's hot. But very unrealistic. A: So was the prospect of Mike coaching again in Cleveland. Q: And what if he struggles with our immature squad? A: I'll still feel fortunate that we nabbed him. Frankly, there wasn't a better alternative. Ten teams in the league may have coaching vacancies; the carousel recycles quickly and with little merit. Q: Vox, I got a very important question to ask you. 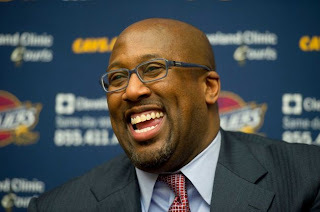 When Mike Brown get out the NBA, how would you like to go into the shrimpin' business with him? A: Not nice. But we'd name the boat Delonte. Q: You wrote in 2010 that "Mike Brown and accountability were never synonyms." A: I was referring to LeBron, and Brown's refusal to call him out for burning shot clocks with the stanky-leg offense. Note that in 2011, especially in the Finals, Erik Spoelstra dealt with those same issues when 'Bron settled for jumpers or became disengaged during crunch time. Q: Spoelstra's a genius now. A: Yeah, because LeBron finally dedicated himself to low post dominance last season. Timing is everything. Q: Will the Heat repeat? A: If they make the Finals, yes. But I have a strange feeling they'll go down to Indiana or New York. Q: Forget Go West, you are the real king of wishful thinking! A: LeBron is still ringless in proper 82-game seasons, dog. Q: After John Kuester returns and Jamahl Mosley (instrumental in the emergence of Tristan Thompson) is retained, who else should round out Brown's staff? A: I'm officially lobbying for Luke Walton to re-sign as a player/assistant coach. And Michael Reghi is pretty much wasting away at KNR. Maybe give him a clipboard, too. Reghi thought he was coaching the team anyway in his last few years announcing games, which prompted Paul Silas to sarcastically quip, "If it isn't Coach Reghi!" Q: Last time you talked to yourself in a column, you were mocking Terry Pluto. It should be noted that Terry also endorses Brown's return. A: Doesn't surprise me. Terry supports just about every move any Cleveland team makes. Q: Now why the potshot? A: Me? No, I'm a writer, not a fighter. Terry's open letters are the voice of the Cleveland fan. Q: If Terry is the voice of the Cleveland fan, what are you? The soft, white underbelly? A: Haha, hardly. I'm a poor man's Scott Raab on my best days. And a less violent version of Robert DeNiro in The Fan on my worst. Q: I wonder if your readers know "Vox" is latin for "voice?" A: Goodnight Vox. Parting is...inevitable.